Another beautiful day in Salt Lake City. Human interest tidbit: Donnie Osmond is a DJ on a Utah station. Who knew? 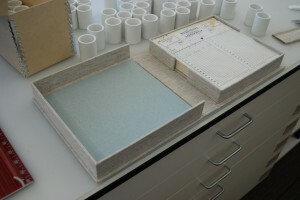 Today, I got right back to my clamshell box project. I proved to be too independent, too soon and had to re do several steps. Sigh. I persevered and Russ was patient and now the finished box is being pressed under weights over the weekend. Here’s how it looks so far. 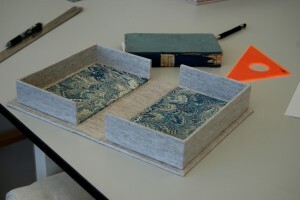 This clamshell is for a small book. I try to pick liners that will not show dirt or book cover particles. This took up a lot of my day. 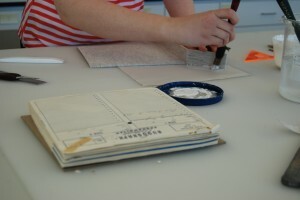 Katie was making a different kind of clamshell; one with a tray on one side made to hold unbound items. I stopped to watch and learn many times. She’s bonafide. 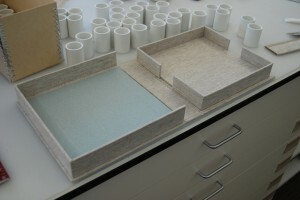 Katie glued the side pieces of the tray onto cloth. Then she wraps them around the base in one strip, which is quite a different construction from a clamshell book box. Notice that both sides of the tray half have an opening. Katie tries the tray "on for size" but really, the clamshell is headed to the bookpress for the weekend! Next, Audrey from Collections Care took Thomasina and me on a tour of one floor of the Archival Storage facility. The CHL is really two separate buildings. One wing is shaped like an L, the other is a square nestled inside of the L. The square part is 6 floors of archival storage. One floor below ground and five above. It has its own foundation and its own HVAC system, etc. It is supposed to survive a 9.something earthquake. Of course, I don’t want to be there the day they test that theory!! We toured the second level above ground. The photograph collections are stored in a constant 55 deg at 35% humidity. It was very neat and tidy with very tall, collapsible shelving. 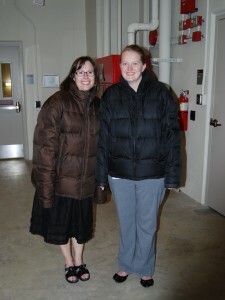 Next we donned arctic parkas and entered the cold storage. It is kept at -4 deg. It takes three days to view your request if it is coming from cold storage because they bring the item back to room temperature slooooowly. Thomasina and I thaw out from a trip to cold storage. It was a true Archiventure! 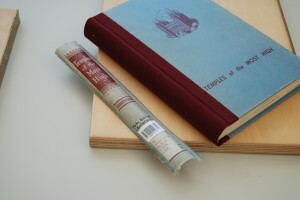 Lastly, Chris McAfee, who is our very cool team leader, taught me how to make a library repair to a loose spine cover. He can make 6 in one hour. I made 1 in 30 minutes. Whew! Lightening speed. When the book comes out from under the press on Monday, I will trim and re-attach the title and call number. I had a ton of fun doing this. Next week, I continue my Archiventures in the Reference Department. This entry was posted in Conservation and tagged boxes, clamshell, cold storage, library repair. Bookmark the permalink.